Mel Gibson shines in this kind of role, and he’s at his very best in this politically charged thriller about a veteran homicide detective who goes after the murderers of his 24 year old daughter. 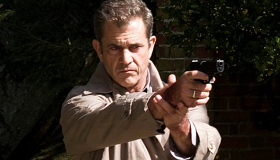 Based on the BBC mini-series State Of Play, the film travels similar territory as the series did, however Gibson’s intensity and star billing, as well as sharp marketing to target the action crowd is going to help Edge Of Darkness outperform its televised forebears. It’s likely also to reignite the controversial Gibson’s dormant screen acting career. In his first starring role in 8 years (he directed mega-hit Passion Of The Christ and Apocalypto in-between), Gibson proves he has not lost his own edge in the kind of revenge thriller that worked so well for him in the past. This time though, there’s a complicated political angle that may make it difficult for audiences expecting a simple Taken-style actioner to follow. As Thomas Craven, a single dad and veteran cop for the Boston Police Department, Gibson goes into action when his 24 year old daughter, Emma (Bojana Novakovic), is brutally gunned down right in front of his house. With other detectives assuming he was the target, Craven soon discovers his daughter was involved in shady matters involving the government corporation for which she worked. This leads Gibson into a world of scandal, cover-ups and corruption. As he finds himself drawn deeper into this shadowy universe, he encounters the company’s self-serving head (Danny Huston) and meets a mysterious fixer, Jedburgh (Ray Winstone), who seems to be playing it from all angles. With each encounter he comes closer to the truth about Emma’s death and the secrets she was carrying. Gibson, busy behind the scenes and hampered by controversy is recent years, manages to return in top form in not only a powerful and forceful performance but one with strong layers of emotion as frequent flashbacks with his daughter at a young age add poignancy to the tale. Huston is properly sinister while an assortment of fine supporting actors fill in the dots nicely, if one-dimensionally, in this complicated storyline. Best of those is easily Winstone who’s just terrific in an award-worthy turn if anyone remembers this picture a year from now. Cast: Mel Gibson, Ray Winstone, Danny Huston, Bojana Novakovic, Shawn Roberts, David Aaron Baker, Jay O. Sanders and Denis O’Hare. Rating: R, for strong bloody violence and language.